Welcome to this summer’s Top Five series. If you missed the announcement, check it out here. This series will pick the “top 5” of various things in my polymer clay studio. We’ll cover everything from tools, clays, tutorials, and so much more. For the first post I’m going to talk about the “Top 5 Polymer Clays” that are always in my studio. These are the clays that I can’t live without. These are the clays that there are always multiple bars of in my clay drawers and I often purchase in bulk. Super Sculpey is always on hand in my studio. Super Sculpey bakes to a hard, ceramic like finish and has a luminescent translucence to it as well. Don’t miss read that this clay is like translucent, as it is not. But unlike all the colored polymer clays, this bakes up with a non-opaque finish that takes a variety of paint applications very well. I add this clay (in the beige color) to absolutely everything. I rarely will use colors straight from the pack, but when I do if I’m making something that will have intricate or tiny details I will often make a blend using Super Sculpey to help add additional support to my pieces. It’s also a great tool to use to make a variety of molds! If you haven’t used this, you should try it today. It ranges from $14.99 – $17.99 per 1 pound brick and is available from a variety of manufacturers. Get it from Amazon today on sale for just $9.00. I have an entire article dedicated to how I use Super Sculpey and why I use it here, make sure you don’t miss this one. There are a large varieties of black polymer clay available on the market. For my needs, Premo! black is the one I turn to each and every time. It’s super pigmented, dark, rich, and deep tone is perfect. You can dilute the strong pigment if you need a less strong black simply by adding a bit of translucent clay. Black is a workhorse for me. Almost every piece I make has black in it somewhere. I love the baked finish of Premo! in general, but the black bakes up with a much more satin finish than some of the other Premo! polymer clays … and I love it! Retail price ranges from $1.97 – $2.99 per 2 oz. block and is available from a variety of manufacturers. Get a starter pack of Premo! from Amazon today. First, let me remind you, my beloved reader, that I am a sculptor first and perhaps secondly a caner. 90% of the work turned out in my studio is sculpture or cane related. Because of this I turn to Premo! White Translucent over and over. This version of translucent is different than the standard Premo! Translucent. Premo! White Translucent (used to be called Premo! Frost in older recipes) has a bleaching property to it and adds a bit of clarity & brightness to a standard translucent. I also feel that compared next to it’s sister, Premo! Translucent, this clay has more clarity. Retail price ranges from $1.97 – $2.99 per 2 oz. block and is available from a variety of manufacturers. Get a starter pack of Premo! from Amazon today. Okay … I’ll get on with it. Premo! pearl is a fantastic clay. I use it almost daily. Not only does pearl add a gorgeous metallic sheen, it is also super soft. I can tell you I have used this clay on it’s own … almost never … but I add it to almost everything. I add it to at least 1 color in almost every skinner blend. I add it to hard clay to soften it. I add it to any color that I want to lighten but not brighten (as white will do). The possibilities and applications with this clay are truly limitless. If you haven’t blended your own clay colors yet, you should start. Start playing. Start having fun and add a little pearl here and there. Retail price ranges from $1.97 – $2.99 per 2 oz. block and is available from a variety of manufacturers. Get a starter pack of Premo! from Amazon today. The reason I love Premo! 18k Gold is wide. But the reality is that this clay is so very versatile. Perhaps one of my favorite uses for it is to add it to my custom blends that I use for skin. It adds a little glow and luminosity to the skin like real skin has. I also like it the best for gold effects. I like a less bold gold color and this one seems to suit my needs. Perhaps my favorite use for this however is to add it to orange & yellow clays for an extra touch of luster that’s simply irresistible. Retail price ranges from $1.97 – $2.99 per 2 oz. block and is available from a variety of manufacturers. Get a starter pack of Premo! from Amazon today. For me, Premo! is my ‘go-to’ clay each and every time. It comprises about 90% of the clay in my studio at any given time. For what I do, sculptures and micro-caning, I find that this clay always suits my needs. 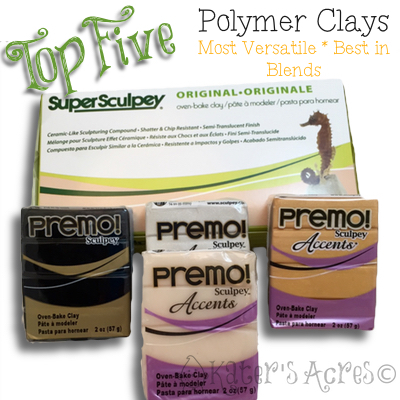 While other clays may be better for other applications, Premo! has been for first choice as a sculptor for several years. This post is not sponsored, paid for, or endorsed by Polyform Products in any way.